A prominent Democratic congressman who has been tapped to lead a major federal agency proposed tariff waivers worth millions for a textile company whose lobbying firm donated thousands to his campaign. The revelations could fuel criticism of a program that some say amounts to a back-door means to secure federal earmarks and encourages companies that use imported products to curry favor with key lawmakers. 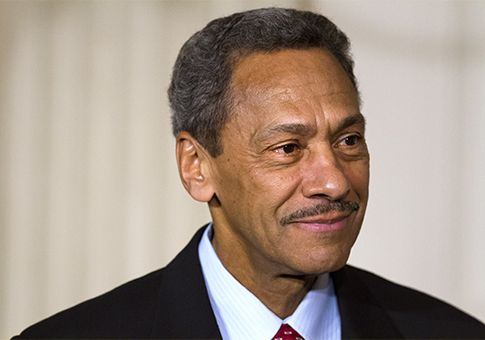 The political action committee of Baltimore-based lobbying firm Venable LLP made a pair of thousand-dollar contributions to the reelection campaign of Rep. Mel Watt (D., N.C.) in May and September of 2012. The donations came shortly after Watt authored 56 "duty suspension" bills specifically exempting products headed for the production facilities of North Carolina-based textile and leather company DyStar LP from import duties. The exemptions, if passed, will net DyStar, a Venable client, nearly $3 million in 2013 alone, according to data filed with the U.S. International Trade Commission. By 2017, the company will save nearly $15 million in foregone tax payments. Watt has since been nominated to lead the Federal Housing Finance Agency, despite his role in promoting housing policies that some say contributed to the 2008 financial collapse. As Venable was contributing to Watt’s campaign, it was also heavily lobbying Congress on the "duty suspension" issue, which observers say has become a means to secure federal pork for favored constituencies. DyStar paid Venable $120,000 throughout 2012 to lobby on duty suspension bills. Unlike many lobbying disclosure forms, which list only general issues under discussion, Venable reported pushing specifically for passage of Watt’s duty suspension bills, and listed either bill numbers or the dyes that would be exempted from import taxes on their disclosure forms. Watt’s duty suspension bills are currently awaiting consideration by the House Ways and Means Subcommittee on Trade. Venable continued to lobby for their passage through the first quarter of the 113th Congress. The Heritage Foundation, which is critical of the duty suspension process, said in a recent paper that it rewards companies for investing in a stronger lobbying presence in Washington. "The process encourages a corrupt political system that rewards businesses for spending money on lobbyists and seeking influence with politicians instead of producing the best goods and services," the report said. Dan Holler, communications director at Heritage Action for America, the group’s advocacy arm, said Watt’s work on behalf of DyStar vindicates those concerns. "This type of behavior, and the special interest subsidies that follow, perpetuates a culture of cronyism and continues to alienate hard-working Americans," Holler told the Washington Free Beacon in an email. "Any time you can go to Washington—or pay someone to go there for you—to attain a special carve out in the law, something is wrong," he added. Many see the duty suspension process as a violation of the spirit or the letter of the House’s self-imposed ban on earmarks. "Limited duty suspensions have been part of the earmark definition for the last five years," one Republican congressional aide said of the process last year. "Certainly it meets the definition" of an earmark, noted Steve Ellis, vice president of Taxpayers for Common Sense. "It's benefitting one company. It's narrowly tailored." Before the ban went into effect, Watt earmarked nearly $38 million for a light rail project in Charlotte, N.C., with a stop about three blocks from a property he owns. Experts say that is the ideal location from a public transit stop to boost a property’s market value. Watt, DyStar, and Venable did not return requests for comment. This entry was posted in National Security and tagged Congress, Federal Bureaucracy. Bookmark the permalink.